I completed this painting in the spring of 2010, just a few months after my younger brother passed away. His death was tragic and unexpected, and will perhaps never be understood. Dark Angel came from this dark time. Some may think my interpretation of a sweet angel in a posture of repose, now transformed into a skeleton, somewhat macabre or discordant. 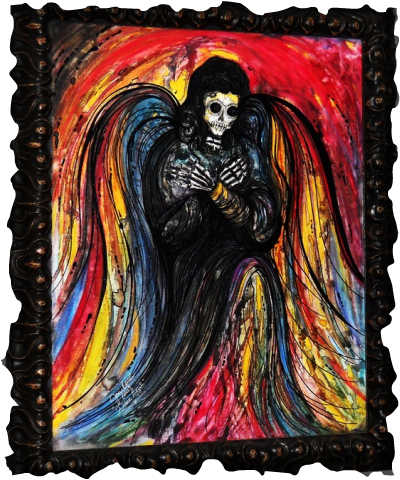 For me, the painting soothes; what better way to integrate life and death than to blend white bones with angel wings streaked with fiery strokes of life-affirming color?